Luv Buds were Buddy L's 1982 (was Buds a play on Buddy L?) version of Uneeda's Petal People. 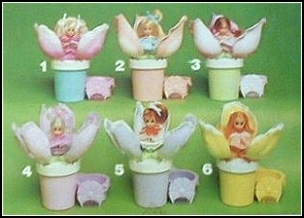 didn't peek out of the petals of their "magic-action" flower until you poured water in the pot. boxes for well under $20. You will rarely find them loose.